"Being Chancellor has been a whole new life for me," says H. Arnold Steinberg. "Nothing compares to this." 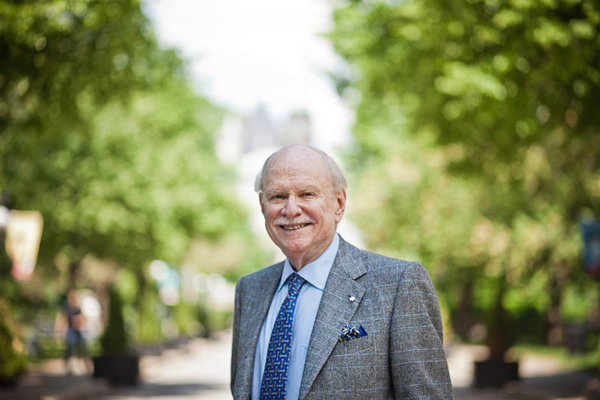 With his mandate ending on June 30, Chancellor H. Arnold Steinberg is getting ready to officiate his last round of McGill convocations. His chancellorship is just the latest achievement for a man whose deep connections to the University span his entire adult life – including 19 years as Chairman of the Board of Governors of the McGill University-Montreal Children’s Hospital Research Institute, 10 years on the University’s Board of Governors and, with his wife, Professor emerita Blema Steinberg, playing an instrumental role in developing McGill’s renowned medical simulation centre. But, as Chancellor Steinberg tells the McGill Reporter, he doesn’t plan to be finished with McGill any time soon. This year’s convocation coincides with the 60th anniversary of your own graduation from McGill. Comparing your education with what you see happening today, what are the big differences? In addition to all the obvious technological advances, the scope of the disciplines that are being explored now have all become far more international, whether it’s sociology or anthropology or social work. The students are another difference. There is almost no relationship between my years as a student at McGill and the present student body. It’s absolutely remarkable, but it’s not a complete shock. My wife starting teaching at McGill in 1961 and continued for 42 years. So I was getting a constant flavour of the students, but I had no real intimate knowledge of the range and diversity and the quality of the students. What are you seeing in today’s student body that is so different from that of the 1950s? I’m surprised by the extent to which students feel a strong sense of obligation to the community, both to the local community and beyond. The extent to which students volunteer to work in areas unrelated to their studies – that would be unheard of in my day. Our current students volunteer to build green roofs in Montreal. They volunteer to help families that are homebound. We have many students who work in various projects with community organizations in Quebec, mentoring students to be able to complete high school. I’ve been involved with “Passport Pour Ma Réussite Québec” to correct the very significant drop-out rate, particularly among boys in Quebec. Today, without a high school certificate, you really are illiterate. And in those areas where there is a lower rate of high school graduation, you have higher crime, you have higher drug abuse. That’s not a coincidence. We have students from the Schulich School of Music who give free lessons to underprivileged kids. And there is a whole range of students who are working to assist underdeveloped communities, in a whole range of ways, in India, in Africa, in Latin America. We have a program where we teach surgery in places like Haiti. We have a program in Africa where we teach people with minimal experience how to use portable bedside ultrasound, which is essential in saving lives of women giving birth. As a result of that experience, we’re now teaching bedside ultrasound to all first-year medical students at McGill. It’s a two-way street. As such, not only do our students come away from their university experience better educated, but they have a profound impact on the community. Those were the kinds of things that were unheard of in my day. I really see that our students feel an obligation to take what they’ve learned and use it to help other people. I didn’t start off very well, but I finished my degree as a good student, and I went on to graduate school at Harvard. But I don’t know if I could get into McGill today! As the quality has improved, the demand to get in has enlarged significantly. The gap between the top universities and McGill has narrowed enormously so that McGill is now in that top range. McGill has always had a good reputation, and all the universities have improved across the board, but McGill has clearly improved at a far faster rate than most of the other universities. That’s something that, as a graduate, makes me very proud. The quality of the research being done here, the quality of the science, the quality of the students – that’s something I didn’t have a full appreciation of, even as a member of the board of governors going back to the 1980s. I didn’t have an appreciation of the change. Why do you think that gap has narrowed? I believe that the absence of a legacy system in Canada, although it makes some graduates unhappy, is a big reason McGill has become world-class. We get the best students, we get diversity, and it’s based exclusively on merit. That’s a remarkable thing. The legacy system is still very active in the States. I know from many friends who have children who are third and fourth generation at some of the top universities in the United States and, by their own admission, that they have a leg up as graduates and supporters of the universities. The presidents of these universities admit that this is the case; they don’t like it, but the cost of running a university with little government support is extremely high. In the United States, the total outstanding student loans is greater than the total outstanding home mortgages! Speaking of legacies… Both you and your wife are graduates of McGill. How many of your three children went to McGill? Actually, none. For two reasons. They wanted to go to university out of town, and they wanted to be independent and go somewhere that their mother wasn’t connected to. I said that’s fine so long as you go to a good university. All three went to good universities. But my son missed Montreal so much that he did his junior year at McGill! How many hours a week does the Chancellorship require? Not more than six or seven hours a week to do the things that are mandated, outside of exceptionally busy times of year, such as Convocation. In my case, it’s probably 30 to 40 hours a week. I look for every opportunity to participate in parts of the University that aren’t included in the job description of the Chancellor. Those are all bonuses for me. How are you filling up those extra 25 or 30 hours every week? I look for every opportunity to take on activities that are unrelated specifically to the Chancellorship. I’m involved in a brain imaging project at the Neuro, for example. I’m heavily involved with the simulation centre in the Faculty of Medicine. One of the things I had not anticipated was being exposed to the academic community in all facets. For example, I get asked more often to serve on statutory selection committees, which are involved in the final stage before an associate professor is made full professor. It’s a very big step. People external to the university are involved, as well as people within the university. You’re dealing with people who are highly specialized in a vast range of areas, whether sociology or political science or history, engineering or medicine. Just being exposed to that has made me more aware of things going on that I wouldn’t have noticed before. I find myself reading more varied books, for example. I’ll see an article in The Economist or the New York Times that I might have passed over – and I read it now with a certain degree of background knowledge. Every day, the academic and scientific exposure expands my whole world of knowledge. Not that I’ve become an expert in any of these areas. It’s an endless stream of excitement, of new intelligence, of new information. You’re an alumni. You’ve held many positions at the University. Now you’re about to become Chancellor Emeritus. When your mandate ends in a few weeks, can we assume you’ll finally be done with McGill? [Laughs] Oh no, no no! In terms of the number of hours I’ll be spending, it’ll be less. Maybe only 50 or 60 per cent of my time. That’s okay. I’ll do more travelling. Because I have the time, I’ve accepted to go back on the board of the Research Institute of the MUHC, which has a number of projects that interest me. I’m also involved with my son, who has a foundation, called the Silver Dollar Foundaton, independent of our family foundation, which concentrates on kids at risk in Quebec. It covers education and a broad range of other areas. So I’ll spend more time on that. But I’m certainly not done with McGill. 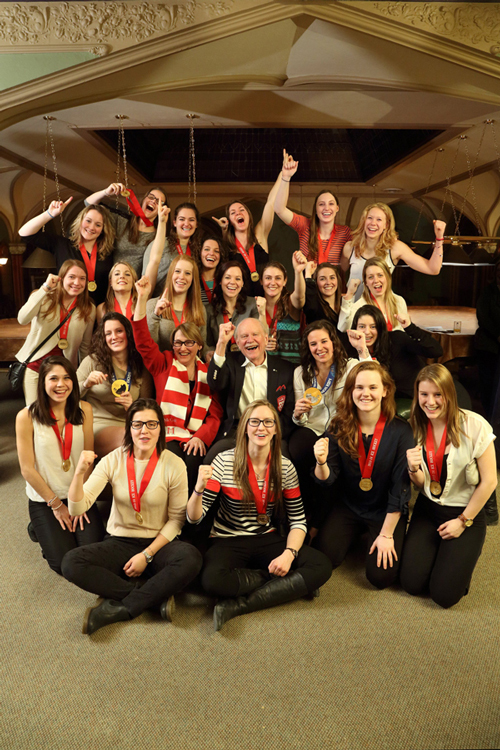 Being chancellor of McGill is a great honour, and it’s my life right now. And McGill will continue to be my life, partly because of my experience as Chancellor. You have been Chancellor for five years. What would you like to see happen at McGill in the next five years? I think McGill is in extremely good hands. But, amongst the things that McGill suffers from is physical space. The University, particularly under Heather Munroe-Blum, engaged a large number of new faculty – over 1,000 new tenured faculty in a 10-year period. We don’t have adequate facilities to house them, nor our students, properly. If you take all the university buildings in Quebec that are more than 50 years old, McGill has more than half of them. Many of them are magnificent buildings but are more costly to maintain. I hope there will be the opportunity to put McGill’s facilities – for teaching, for research, for science in general – back in shape. Certainly, the new hospital, when it opens in 2015, will be one of the great health sites in North America. Of course there are temporary traffic problems and other inconveniences, but the patients will benefit enormously. But so will McGill’s teaching and research. It will have a profound impact on the health sciences and on Montreal. The faculty is extremely strong. The student body is extraordinary. There is no shortage of great students who want to come here. But we do need proper physical facilities. We have a great location, and part of the reason we can attract the students that we do is because we have this campus atmosphere in the centre of a city. The campus, and what’s around it, makes a big difference. McGill does an awful lot with a minimal amount of funding, but there’s a limit to what can be done. What are your thoughts on presiding over your last Convocation ceremonies as Chancellor? Yes. It was an absolute, total shock when Principal Munroe-Blum called me and said she wanted to have a chat. I was active at McGill, so we knew each other. But the chancellorship was so far off my radar. She invited me to her home, and when she offered me the position I was so dumbstruck that I told her, “Let me think about it.” [laughs] I went home and then called her right back and said “I was in a state of shock. I’d be honoured to accept.” I think she was shocked that I said I had to think about it! I remember my very first class at McGill in the fall of 1950. It was in Moyse Hall, and it was given by the then-Principal F. Cyril James who was an internationally renowned economic historian. When I walked into the Arts Building that day, I remember seeing the list of Principals and Chancellors on the wall. It was a much shorter list then. The Chancellors were all “Sir” somebody or “Lord” somebody. I remember thinking “This is an impressive place,” never thinking that one day my name would be on there. I still get enormous pride when I walk through and I see my name. For me, being Chancellor of McGill has been a whole new life. I’m going to be 81 in a few days. To be able to work virtually full-time in exciting new frontiers – it’s something I couldn’t anticipate. It’s invaluable. Other than family, it’s the thing that’s given me the most pride in my entire life. And I’ve had a very exciting life and very active business career. But nothing compares to this.